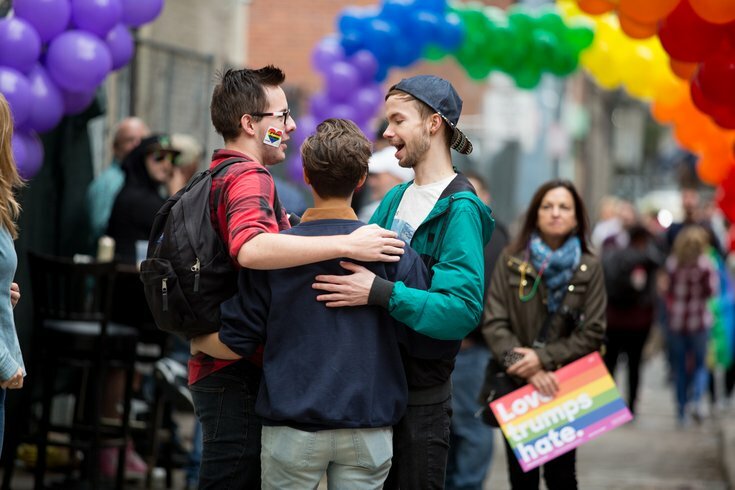 Chris McGovern (left) and Zane Zerman hug Andi Koch during Philly Outfest on October 9, 2016. This year's Outfest, the largest Coming Out Day event in the world, will take place Sunday, Oct. 7. The annual event draws close to 50,000 to Philly's Gayborhood. Activities take place in a 10-block area, with the main stage at 13th and Locust streets and the food court at 12th and Spruce streets. At Outfest, there will be drag shows, carnival-style games, music, hundreds of vendors, specials at neighborhood bars and restaurants, and dancing in the street. The festival, which is free to attend, will run from noon to 7 p.m. This year marks the 28th Outfest in Philly.